What is Strategic Housing and Regeneration Programme (SHARP)? Flintshire County Council is committed to meeting the needs of the local community for affordable housing across the county. Working with their development partner Wates Residential, the Council has started a new initiative to build new homes through SHARP. The SHARP will deliver 500 new homes across Flintshire by 2021 of which 197 will be affordable rent (owned and managed by North East Wales Homes Ltd) and 303 social rent (managed by Flintshire County Council). As part of the project, Flintshire County Council and Wates Residential have made a joint commitment to create extensive opportunities for local training and employment. It is estimated that over 2,000 people will be employed throughout the SHARP and an estimated 20 apprenticeship positions will be created. The properties will be built to a high specification with modern kitchens and bathrooms. In order to keep running costs to a minimum energy saving standards will be incorporated, such as modern windows and insulation materials. A development of 27 units comprising a mix of 2 and 3 bed houses and 2 bed bungalows. Situated on the site of the former council depot which has been derelict for some years this development will deliver 24no new affordable and council homes. The scheme has been designed to retain the existing mature tree line to the site boundary with all properties set back beyond this to minimise the impact on the existing properties in the area. Maes Gwern is a development in Mold between Flintshire County Council and Wates Residential of 160 houses and apartments. 48 will be affordable properties for rent and shared equity and the remaining 112 will be available for purchase in the open market. Affordable properties will consist of two and three bedroom semi-detached houses, two bedroom terrace houses and one bedroom apartments. All properties will be tenure blind. This development has been designed and inspired by the themes of a ‘garden village’. The themes which form the development not only help the community to flourish socially through the interaction of private and public space but also self-polices against crime and anti-social behaviour. Works started to the development in September 2018 are due for completion in Spring 2022. A unique development of 4nr one bedroom apartment and 8nr two bedroom apartments situated on Sealand Avenue, Garden City. The Scheme features a bespoke, innovative timber frame design creating a high quality environment. To be considered for one of the Council properties, you must qualify for social housing and an application must be made to Flintshire’s Housing Solutions team on telephone 01352 703777. A local lettings policy has been prepared which gives preference to those living or having a connection in the immediate community. If you do not qualify for Council housing then properties are also available at an affordable rent (lower than market rent). An application can be made on line via the following link - https://taiteg.org.uk/en/am-i-eligible-to-apply. Again in the first instance properties will be let to people with a local connection to the area however this is widened depending on demand for the homes. The development partners, Wates Residential are keen to employ as many local people as possible on the construction sites working with local sub-contractors. They are also committed to offering learning and apprentice opportunities. Anyone interested in seeking employment can contact The Wates Residential Project Manager on 07795 520727 on or call in at the site office at the Walks in Flint. Located on the corner of High Street and Mold Road, this new development of 3 x 3 bed and 3 x 2 bed council houses will regenerate this area creating an attractive residential area providing much needed homes in Connah’s Quay. This is a development of 12 new 2 and 3 bedroom council homes. It is a small cul de sac on the site of the former Custom House Lane School. This is the first build of new council homes in Flintshire since the Right to Buy Scheme was introduced over 25 years ago. The properties have been built to a high specification with modern kitchens and bathrooms. In order to keep running costs to a minimum energy saving standards have been incorporated such as modern windows and insulation materials. The former garage site located off St Mark’s Avenue has been cleared and replaced by 5 x 2 bed council houses. A former garage site has transformed into a new development of 3 x 2 bed houses and 2 x 3 bed houses creating a small attractive residential area for local people providing much needed council housing in the village. A former garage site (which had become unfit for purpose) has transformed into a new development of 4 x 2 bed apartments and 4 x 2 bed bungalows creating 8 new council homes for local people. 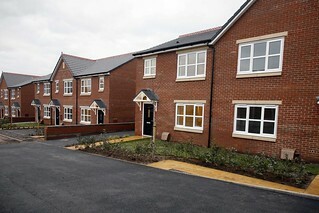 The Walks, Flint has delivered 92 new homes for local people. There is a mix of 2 and 3 bed houses and 1 and 2 bed apartments. The tenure is a mix with 62 of the homes for intermediate rent, owned and managed by NEW Homes, and 30 are Council homes for social rent. Completion of this site has created a new community in the heart of Flint and turn what were once tired maisonettes into a modern housing development. Ysgol Delyn had been demolished and is now a development of 16 new council houses located close to the town centre. The residential area is made up of 10 x 2 bed and 6 x 3 bed houses to create a modern and attractive development providing much needed housing to local people. Situated on Melrose Avenue, Higher Shotton this development of 4no. 2 bedroom houses, 2no. 1 bedroom and 2no. 2 bedroom apartments has replaced the redundant Melrose Community Centre which formally occupied this site and was subject to vandalism prior to its demolition.